A 13-month-old girl has been flown to hospital after a serious house fire in Moray. Two adult occupants are also being treated after at least 40 firefighters were called to MacDonald Drive in Lossiemouth at about 03:45. The girl was airlifted to hospital in Glasgow from Dr Gray's in Elgin. A man, 35, was taken to Aberdeen Royal Infirmary and a woman, 31, was also expected to be transferred. Police said all three were in a serious condition. Six fire engines and a height reach vehicle were joined by support units at the scene. The fire was later brought under control. 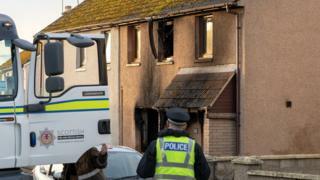 Police Scotland said a joint investigation would be carried out with Scottish Fire and Rescue Service. Det Insp Norman Stevenson said: "Our inquiries are at an early stage in establishing what caused the fire. "The three occupants of the house are all in a serious condition and our thoughts are with them and their family at this time. "MacDonald Drive between St Margarets Crescent and Rinnes Drive is currently closed to allow access for emergency services vehicles. The local community is thanked for their patience and understanding whilst we carry out our inquiries."